News from LMCU: Max Rewards – do the math! Max Rewards – do the math! Everyone buys gas. And groceries. With LMCU’s Max Rewards Visa credit card, you’ll save with every drop of gas, every can of creamed corn, and everything else as well! Every dollar of purchases is rewarded with cash back or points, good for travel, merchandise and more. With 3% back on gasoline, that’s a savings of 11 cents per gallon, at $3.75/gallon*. At the grocery store, Max Rewards delivers 2% back. That’s like getting a $3.00 off coupon with every $150 spent on groceries. And with 1% back on everything else, the savings add up even further with every purchase. 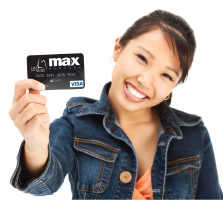 Apply for your Max Rewards Visa card online at lmcu.org, or stop into any branch location. *3% earned on first $500 spent on gas/month, 1% thereafter after maximum is reached.